Carnival Cruise Line has partnered with world-renowned chef and restaurateur Emeril Lagasse on his first-ever seagoing restaurant aboard Carnival’s newest ship, Mardi Gras, setting sail in summer 2020. Named after Mardi Gras’ hull number at the Meyer Turku shipyard in Finland, the bistro will celebrate New Orleans’ rich culture with Creole favourites and daily specials. The menu will include: oyster and cochon de lait po-boys, muffaletta sandwiches, Emeril’s signature barbecue shrimp, fresh seafood ceviche, roasted duck and Andouille sausage gumbo, jambalaya, and complements such as Creole potato salad with diced scallions, and red beans and “jazz-man” rice. Breakfast offerings will feature shrimp and grits and a shrimp Creole omelet. The New Orleans classic Bananas Foster and lemon ice box pie will be available for dessert. 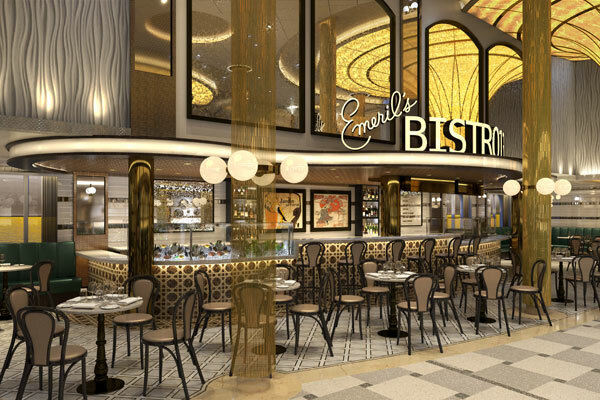 Emeril’s Bistro 1396 will take centre stage in Mardi Gras’ French Quarter, one of the ship’s six themed zones where guests will find fun, memorable ways to create their own personalized vacations. The French Quarter will capture the festive spirit of Louisiana with food, cocktails and, of course, live jazz. Currently under construction at the Meyer Turku shipyard in Turku, Finland, Mardi Gras is slated to enter service in Europe Aug. 31, 2020, before repositioning to New York for a series of voyages then shift to Port Canaveral for year-round seven-day Caribbean cruises beginning in October 2020.